Duke Libraries Tell Stories to Raise Funds. Plus 3 Tips for Your Marketing Team. – StratGo Marketing. Plug-in marketing department services. Duke Libraries Tell Stories to Raise Funds. Plus 3 Tips for Your Marketing Team. How do you motivate alumni to give money to libraries? Or, more generally put, how do you persuade someone to do something that’s not top of mind? Storytelling has been a powerful marketing communications tool for a long time. Today, it’s often talked about in association with content marketing. And while it’s not a new tactic, when used effectively, it can produce important business results. 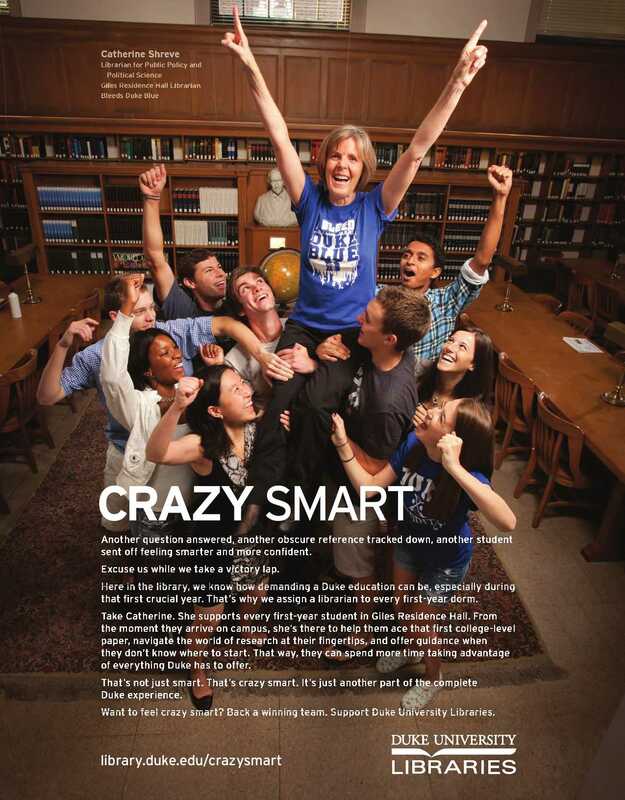 Take this ad for Duke University Libraries, for example. The photo caught my attention and led me to read about how Duke assigns a librarian to every first-year dorm. To me, that’s an interesting story I’d like to know more about. The eye-catching visual, along with the text, quickly dimensionalizes an abstract concept and makes it easy to understand and relate to. There’s a URL to get more info. The result: Duke has a greater chance to raise funds earmarked to its libraries. Storytelling has always been a part of great advertising, but it’s best to think about storytelling more broadly as an integral part of great marketing (including great selling). Some organizations are even hiring reporters to strengthen their brand communication capabilities. And a new term has evolved, called brand journalism. The capability to develop an engaging story that can achieve communication and branding objectives should be in your marketing toolbox. And it should encompass a variety of platforms — advertising, your company blog, a Facebook post, customer presentation material, or even internal organization messaging, to name a few. Cultivate internal capabilities, and at the same time, tap into outside expertise as needed. Your storytelling should support your business and marketing strategy. Sounds simple, but make sure you have alignment. The story has to be relevant, engaging and meaningful to your target. Doing so provides an important product or brand benefit that can be physical or emotional. Storytelling needs to be customized to fit the communications medium. The approach for a print ad is not the same as for your social media marketing platforms. How are you integrating storytelling into your marketing and customer experience plans? What stories can you tell to drive your business? Duke University tells an easy-to-relate-to story to help raise funds for its libraries. The capability to develop an engaging story that can achieve communication and branding objectives should be in your marketing toolbox.